If you’re looking for weight loss sauna suits that look great, feel great, make you sweat a lot, and don’t rip like cheap suits, we’ve got some product ideas for you. Sauna suits do just what they are designed to do: keep the sweats pouring off you so you lose water weight quickly. If you’re not thrilled by the idea of putting on one of these weight loss sauna suits and doing suicide sprints and jump burpees, and would rather wear the suit while sitting at your computer, you can do that too. But keep in mind you’ll lose more weight when you move: you only burn about 1.4 calories per minute while sitting quietly verses 9 or more calories per minute when in motion. The 4Fit Heavy Duty Sauna Suit is one of the most attractive workout suits we’ve seen. They run about $45.95, but the advantage here is that they don’t rip like the cheaper $10 vinyl suits do after a single use. These patent-pending weight loss sauna suits are made with a 100% extra-soft Sweat Aid inner lining that really promotes sweating at all levels of low intensity or high intensity workout. No one will know you’re wearing one of these suits because they look like an ordinary cotton and polyester track suit. Sizes come in S/M, L/XL, 2XL, 3XL, 4XL. The Title Pro Hooded Sauna Suit is another good looking weight loss suit. It sells for around $49.99 and is constructed with two-layer thick nylon with a water-repellant PVC rubber nylon liner. Like the Realsauna suit, it comes with a drawstring hood and snug wrist and ankle cuffs to keep the heat in. The pants have an elastic waistband with a drawstring and have roomy pockets to keep your keys, mp3 player and other valuables. 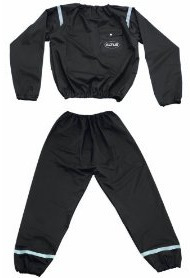 These quality sauna suits fit a bit looser for athletic play, and come in black in Men’s sizes L, XL or XXL. 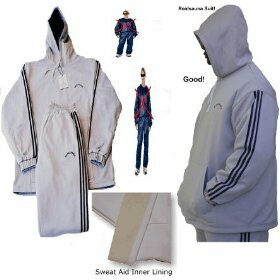 Kutting Weight also makes some very popular, low-cost sauna suits that you should consider as well. If you don’t want to spend $50 or $100 on a suit unless you’re sure it will work, you can first try one of the less expensive weight loss sauna suits that sell for about $15. There’s the SunFitness Deluxe Universal Vinyl Sauna Suit (one size fits all for $11.99), and the heavy duty Valeo Sauna Suit (one size - $11.49), or there’s the Altus Athletic ATTS Thermal Training Suit ($14.99) which comes in three sizes and gets positive reviews from its owners for inducing intense sweating and doesn’t easily rip or tear. With any of these inexpensive sauna suits, as long as you can get the right size and only plan to wear it on a treadmill or walking outdoors, odds are you won’t have any problems tearing the suit. Now it is true that the pounds lost while exercising in weight loss sauna suits is mainly water and that the water weight will be gained back again as soon as you rehydrate. But there are other advantages to the suits: you are also keeping the muscles warm as you work out, and the sweat promotion is the body’s way of cleansing itself of toxins. Lose Weight in a Sauna Suit – It Works!